Filter is a useful feature for quickly obtaining specific information. Filter will help you find the right thing among all the projects, just to show what’s relevant to you in the timetable and in the project calendar. With the help of filters, you can, for example, quickly find the cases that you monitor, which have high prio, belonging to a specific version (project phase) or cases that you have created. 1. Create filters by accessing a project and then the cases. 2. Select one of the options in the Add Filter drop-down list. 3. Then select the options that provide the information you are interested in. It is possible to select multiple values ​​simultaneously by clicking the plus sign. 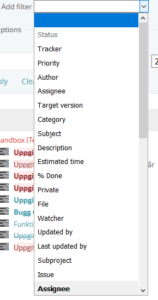 Then the drop-down menu will be converted to a selection list instead. Use the Ctrl key on the keyboard to select multiple cases at the same time. 4. Then click Apply to get the desired view, or Save if this is a view you would like to appear on several occasions. When you save a question, give it a suitable name that will appear in the right column under the heading My own questions. Choose whether to be public, be available to all projects, and how you want the view to be displayed, ie how to group the results of your question. To get this view on a later date, just click on the name of the filter under My own questions. Once you have chosen the filter to be visible on all projects, you can filter the information on all the projects you are part of. However, your project members do not see it. All filters are personal. To return to the default view, just click Reset under Filter settings. The results shown in the browser can also be printed and saved as a PDF, but also as a .csv file, which can then be further processed in an application on your computer, such as Excel. The options are found at the bottom right corner.